You know I sometimes go a little crazy with cooking and baking with lemons. I’ve mentioned this before. It just happened again. Just recently, I made a lemon cream sauce for pasta, a few different kinds of lemon cookies, and lemon ice cream all in one weekend. Organic Meyer lemons aren’t always easy to find here but I got lucky one day, so I had a good excuse, right? You see, I do have two Meyer lemon trees, but they’ve had a tough couple of years. From the two trees, I only harvested one useable lemon this year. I blame the squirrels and birds, and well, I should probably keep a closer watch on the trees. So, when I find a good supply of Meyer lemons, I take advantage of it. This ice cream is from The Perfect Scoop , and it’s incredibly easy. Everything is whizzed up in the blender, and there are no eggs and no custard to cook. I love it when a recipe is this simple with a result that’s this delicious. 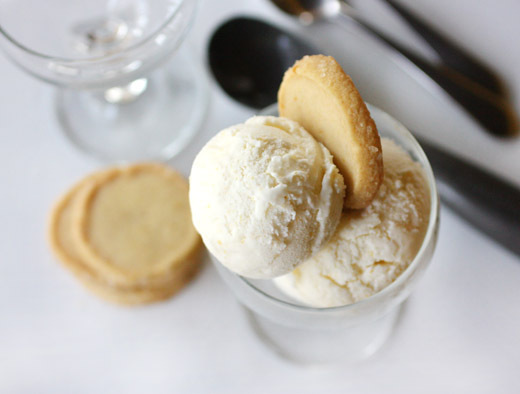 It’s a creamy but tart ice cream that was fun to scoop up with a crunchy shortbread cookie. The cookies are from Martha Stewart's Cookies , and the recipe is also online. Orange zest is suggested for the cookie dough, but obviously, that got replaced with lemon zest here. There’s added flavor and a pretty, pale yellow color from cornmeal both mixed into the dough and rolled onto the edges before the cookies are cut. Together, the ice cream and cookies made a perfectly lemony dessert. I wasn’t kidding about how easy this ice cream is to make. You zest two lemons into a blender pitcher and add a half-cup of sugar. Just blend those together until the lemon zest is chopped very fine. Then, add one half-cup of lemon juice. I was using large lemons, so two was enough for one half-cup of juice. Also add two cups of half-and-half and a quarter teaspoon or so of salt. Blend until smooth, and chill for at least an hour before churning in an ice cream maker. The cookie dough is made by creaming together butter and confectioners’ sugar and then adding lemon zest and vanilla extract. Flour, yellow cornmeal, and salt are then added and mixed to combine. The finished dough is divided into two equal parts which are each rolled into a cylinder, wrapped in plastic, and refrigerated for an hour. The logs of dough are then rolled in cornmeal, and I added some sanding sugar as well, and then cookies are sliced and baked for about 30 minutes. Of course, other types of citrus could work here, or you could even mix more than one kind. But, once I’m thinking lemon, I tend to have a one-track mind. Right now, my trees are covered in blossoms, making me hopeful for lots of homegrown lemons next winter. I promise to make better use of those lemons than the squirrels or birds would. A heavenly dessert! I am a big fan of lemony treats and shortbread cookies. Lemon is my chocolate and I would prefer it anytime. Great finds. I just love lemons too. What a refreshing dessert and so perfect for our current steamy weather. What a delightful dessert! I would never get tired of citrus sweets. I like most foods, but lemon is a particular favorite. I kind of agree with Bellini's comment that lemon is my chocolate. ;-) Good stuff - thanks so much. You can never cook enough with lemon as far as I'm concerned. This looks wonderful Lisa, great combination. pucker up. while i see lemon sorbet and gelato all the time, i don't think i've ever seen a lemon ice cream, much less tasted one. lovely, lisa! 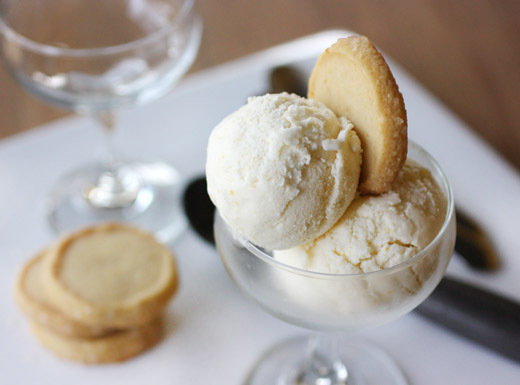 Lemon is one of my favorite flavors too and this dish of ice cream and cookie looks perfect. I made meyer lemon ice cream recently also and now I'm an addict! The cookies to go with them sound just perfect! Yep - right up my alley. My favorite Blue Bell flavor was always the hard to find lemon - I bet this would suit my grown up taste buds to a T. Cheers to lemon lovers! Lemon desserts are my favorite! What an irresistible combination, cookies and ice cream! 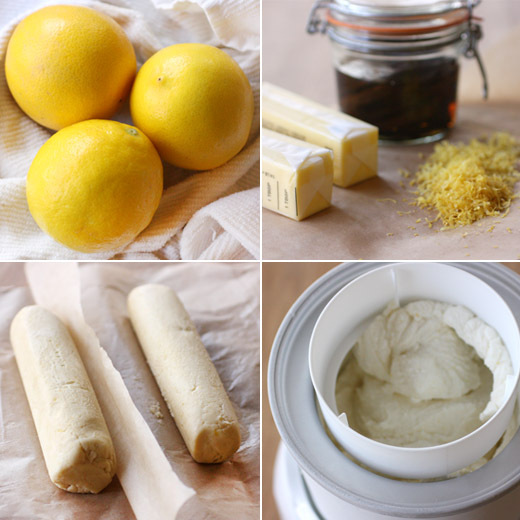 love the lemon ice cream and citrus cookies - one can never have too much lemon, as far as I'm concerned! This sounds amazing! I love lemons too, so i think, I have to give this a try...looks gorgeous! Lemon fever must be going around...I made two lemon things last week to post. My sister is a complete lemonholic (if that's not a word, it ought to be); this is right up her alley. As for me...this ice cream looks fabulous, Lisa, and the fact that you don't have to make a custard s a big plus. Bet it's nice and tangy. I'm so relieved that I'm not the only one with an obsession for lemons. I use them for sweets and salty dishes, they have such a great flavor. I love lemon desserts too, but I didn't used to when I was a kid. Now I'm all about lemons. It is awesome that you have Meyer lemon trees. The benefits of living in warm weather. Beautiful! I adore lemon ice cream, all that cream elimantes all the horrible acidity and just leaves the beautiful lemon flavour behind.